Now that is a cookie! I love big fat filled cookies! Yum! These look so yummy Anne! I printed the recipe and I'll make these this week for my cute husband who can't get enough peanut butter or chocolate! Those look incredible... and it's not helping that it's lunch time here! :) Can't wait to see your Chocolate Spice Quickies! Amazing cookies! My daughter and I have been talking about whoopie pies all week. Now we're going to have to make some and try your icing recipe. LOVE that you made whoopie pies with these. Definitely have to try this one out. Chocolate and PB! Perfect!! 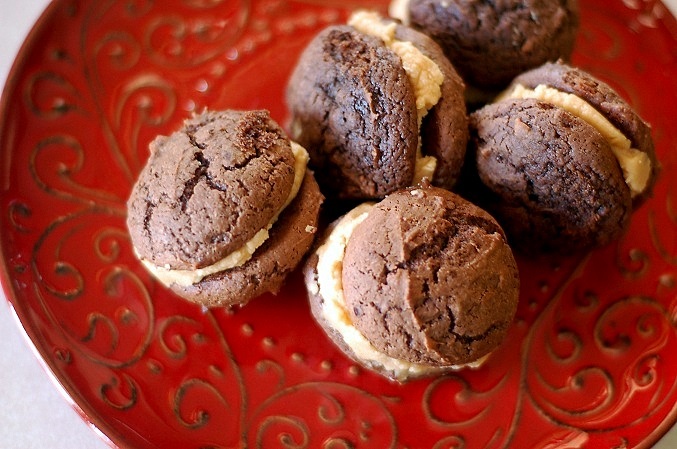 I was looking for a whoopie pie recipe all week. You came to my rescue! Great flavor combination. I have yet to make a whoopie pie, I don't trust myself. I have no self control! That pb filling looks delish, I'll keep it in my files. This looks fabulous. I have yet to make a whoopie pie!